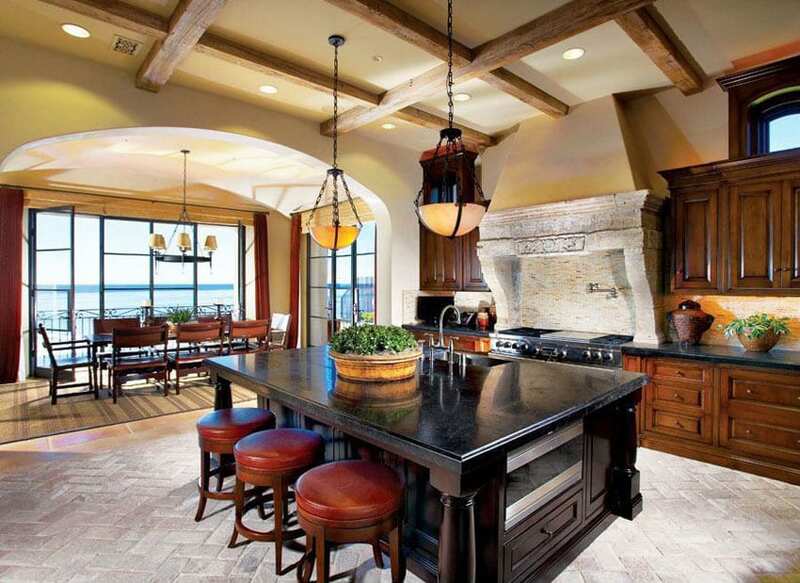 Welcome to our gallery of stunning gourmet kitchen design ideas. These kitchens are a chefs dream come true and come equipped with professional appliances, multiple ovens, large countertops, plenty of under cabinet storage, and an effective work triangle. 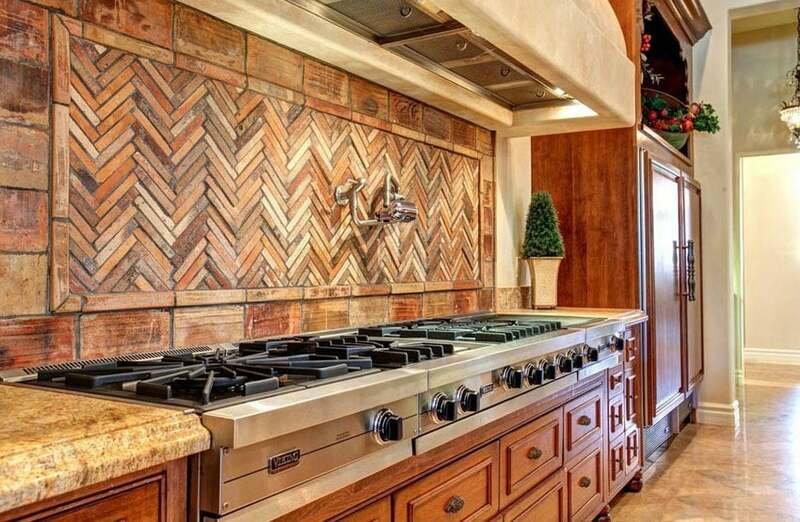 Take a look at these chef’s kitchens for inspiration for your next home or remodel project. 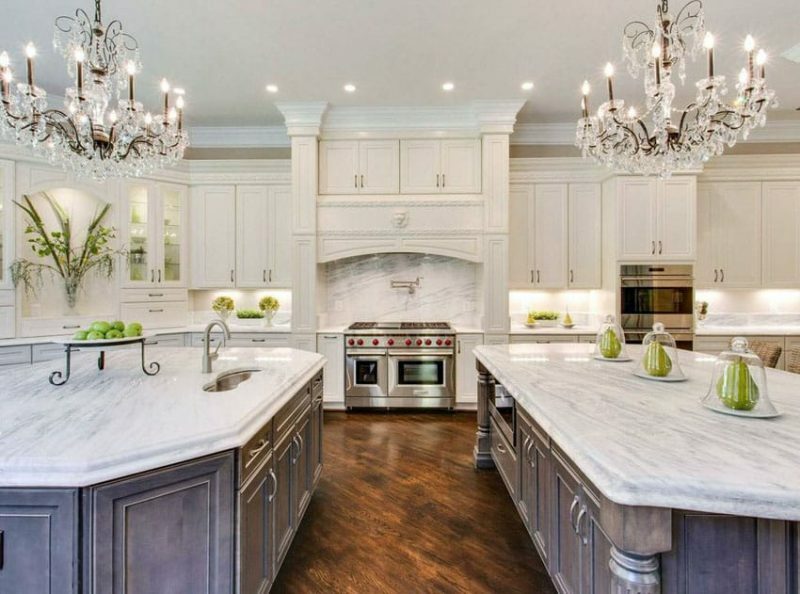 Exuding the elegance and class of classic kitchen designs, the gourmet kitchen in the picture above, uses high-quality materials and finishes in order to create this beautiful design. The spacious kitchen uses hardwood flooring and wooden kitchen cabinets, combined with marble countertops for a clean and elegant surface. The size of this kitchen gives enough space for the two large kitchen islands, allowing multiple users to work in the kitchen at the same time. For some families, the kitchen & the dining area is not only a place for eating and cooking, but rather, a place for family gathering. This is the reason some families take the design of their kitchen very seriously. For food enthusiasts, chefs, and basically, anyone who has a passion for cooking and takes their cooking seriously even at home, considering a gourmet kitchen in your home would definitely make cooking at home more enjoyable. 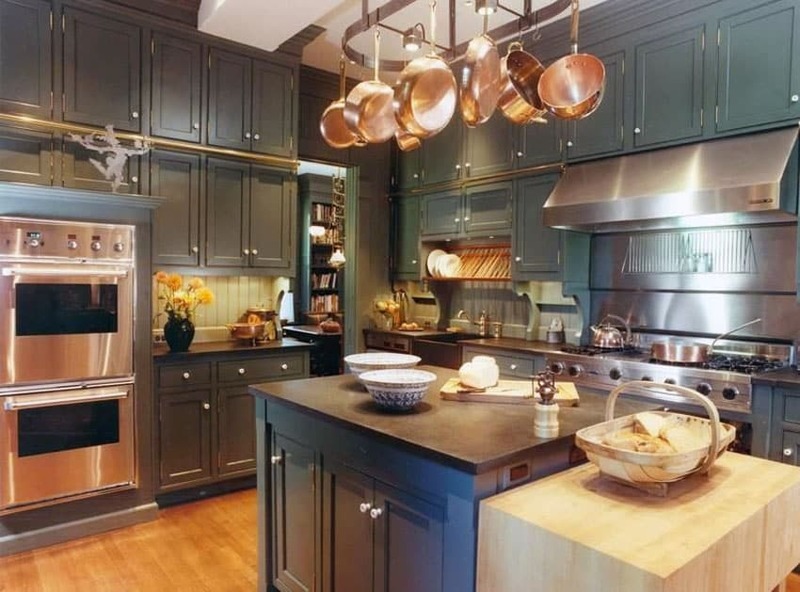 What sets apart a gourmet kitchen from typical home kitchens is that its design is patterned on professional kitchens. More than the aesthetics, the placement of appliances and the overall layout is given much importance, delegating sections for cooking, food preparation, storage, washing and serving. Gourmet kitchens are equipped with professional-grade equipment, but with design aesthetics that would match the interiors of you home. Designing gourmet kitchens takes a bit more effort and collaboration between the designer and the user/s of the kitchen. Aside from the general layout & design style, many aspects are taken into consideration during designing to be able to create a gourmet kitchen to match your needs. Frequently-used appliances/equipment – each person has a personal preference for appliances, so it is important to know what type you prefer and which ones you will use the most to be able to successfully integrate it into the layout. The layout of your kitchen should match your needs and your cooking habits to make it very efficient and functional. Durability of materials and ease of maintenance should also be given emphasis, since the appliances in this kitchen would most likely be well-used and are not merely installed for display. Lastly, the aesthetics of the space should never be forgotten as this kitchen is still part of your home, and should somehow match the overall ambiance of the interiors. Understanding your needs and requirements is the key in creating a well-design gourmet kitchen that would make cooking a pleasure even at home. A gorgeous contemporary style gourmet kitchen with industrial elements, giving it a unique flair and tons of personality. Cherry wood floors combined with white walls and high ceiling create a spacious and airy ambiance. 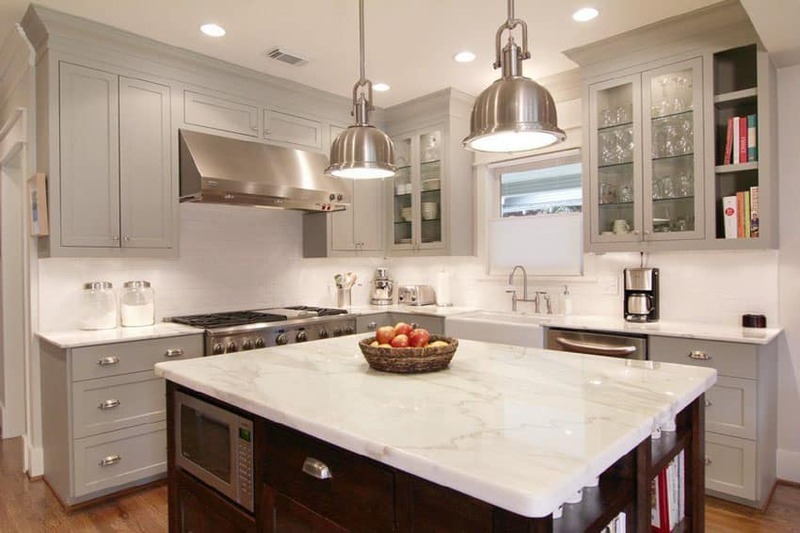 All kitchen cabinets are white and uses white solid surface for the countertop for a seamless surface. The kitchen dedicates its storage and wall-units on the left side, and in the middle is a large kitchen island for food preparation, entertaining, as well as washing. 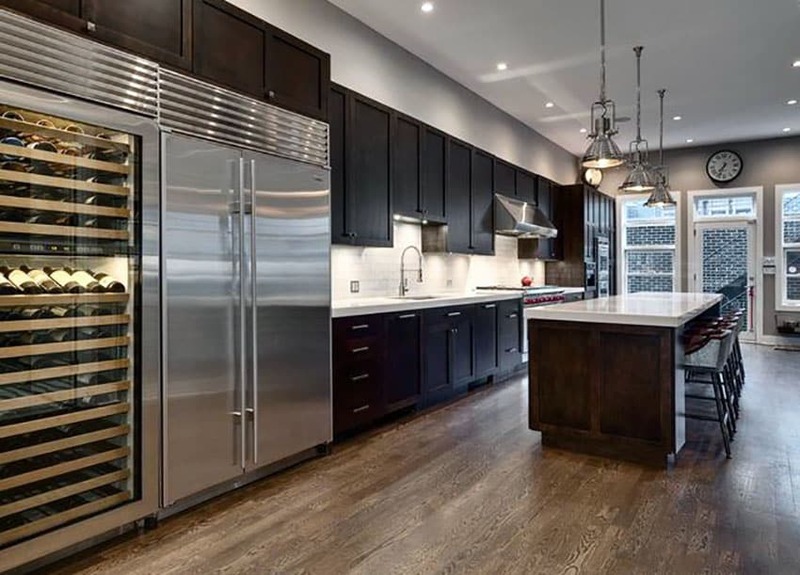 The hallmark of a gourmet kitchen are their professional appliances, effective work triangles, large cabinet storage for pots/pans, accessories and utensils, large countertops and a layout that encourages entertaining. 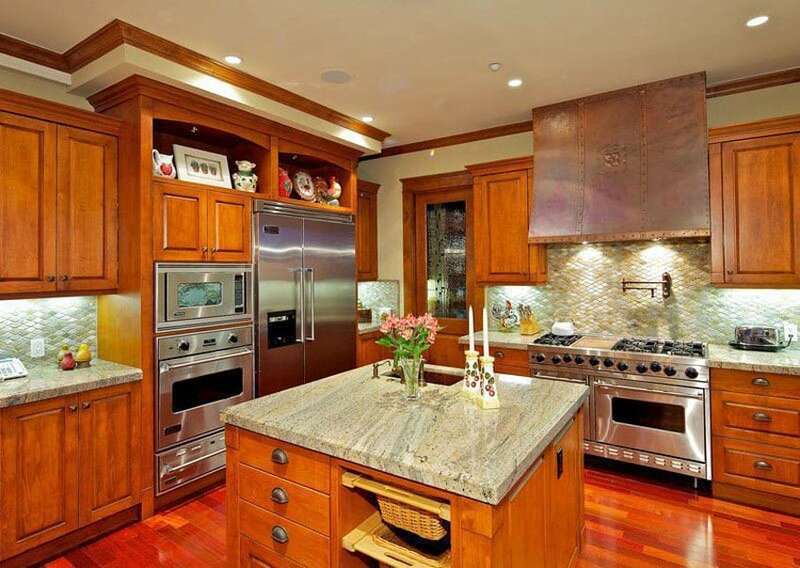 Gourmet kitchens should be laid out for maximum efficiency with zones for food preparation, cooking and cleaning. Gourmet kitchen appliances – Appliances should be geared toward performance. Chefs prefer professional gas ranges with a double oven to prepare multiple dishes at the same time. One should be a convection oven to ensure that food cooks evenly throughout. Stain resistant countertops – Easy to clean countertops are a must in a gourmet kitchen. Durable materials such as granite, quartz and stainless steel are some of the least porous and most stain resistant. High-end refrigerator – French-door style refrigerators with a freezer drawers on the bottom are effective for their space saving design and convenience. Putting food products near eye level makes them easier to quickly reach while preparing meals. However, many chefs prefer a separate refrigerator and freezer if given the choice. Cooktop or sink in the island – Having the cook top or sink installed int he island is great for those who want to have conversations with family or entertain while cooking. Having the cook top on the island and facing quests while cooking provides good Feng Shui principles that many chefs prefer. Warming drawer – A warming drawer helps keep food warm until its ready to be served. A warming drawer is far superior to reheating items in the microwave which can affect the taste. Microwave drawer – Often hidden from sight under the countertop and built in to the cabinetry a microwave drawer can free up needed counter space and provide a clean appearance. Dishwasher drawer – A dishwasher drawer is effective for those who do a lot of entertaining. This can be placed separate from the main dishwasher and closer to a bar sink where dirty glassware can be easily managed. This beautiful contemporary kitchen showcases lovely Calacatta marble countertops and a functional island with built-in sink and storage. The kitchen layout offers an effective work triangle with easy access from the stovetop to countertop space and accessories. 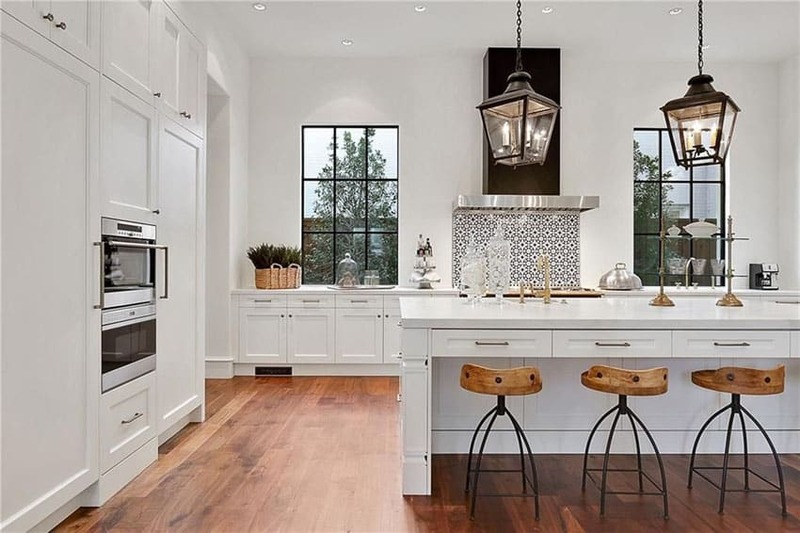 Going for a more traditional style, this gourmet kitchen keeps a very classic look by concealing the kitchen equipment and appliances in cabinets. This allows for a cleaner look, and would not disrupt the illusion of an old, classic kitchen. Nevertheless, the kitchen is still fully equipped with industrial-grade appliances, and has a large area to work efficiently. 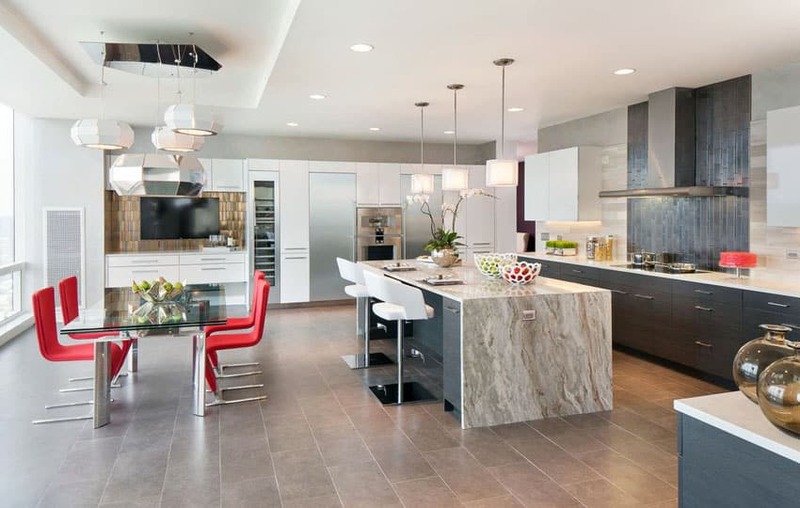 This contemporary kitchen design features a large breakfast bar island with a built-in cooktop. A kitchen island with cook top is recommended for those who want to maximize conversations with friends and family while preparing food. 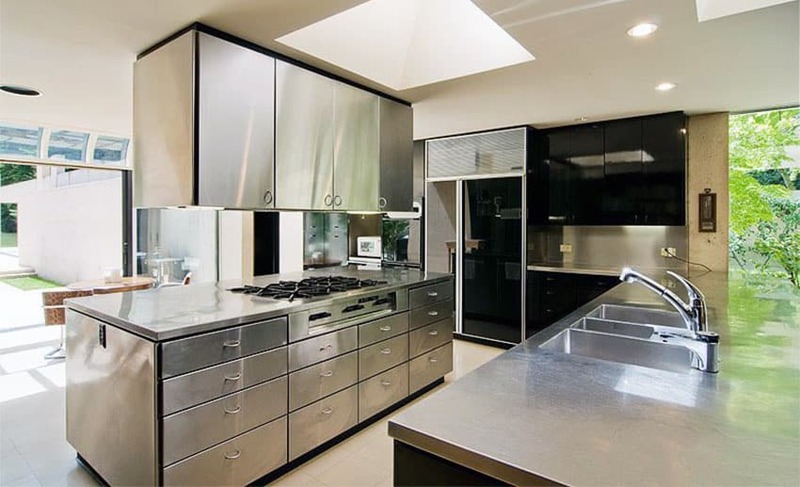 This modern kitchen offers an effective layout with stainless steel countertops for ease of cleanup and efficiency. The kitchen features a useful work triangle with two islands. 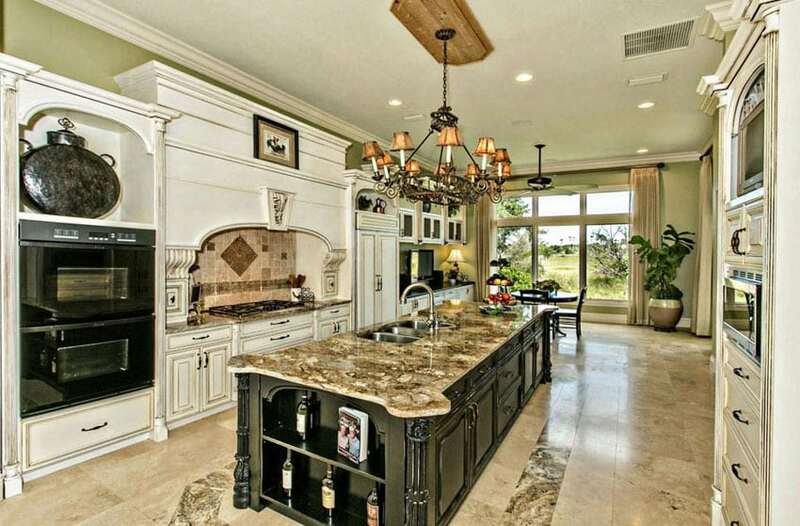 One island provides a built-in cooktop with overhead cabinetry, while the other island has a built-in sink. For a more casual and homey look, this gourmet kitchen uses a simpler style for the paneled cabinets in the kitchen, and combines it with white marble for a clean look. One large square kitchen island is placed in the middle to give a large preparation area, which also doubles as a bar counter You can see that this kitchen uses professional-grade appliances, most of which are made from stainless steel for an easy to maintain and durable kitchen. With a smaller floor area, this gourmet kitchen compensates by creating a more efficient layout. For this kitchen, food storage is placed in one area with industrial-grade appliances, while the cooking and preparation areas are also separate. White is the color of choice for the kitchen cabinets, while quartztite was used for the countertop for an easy-to-maintain, non-porous surface. 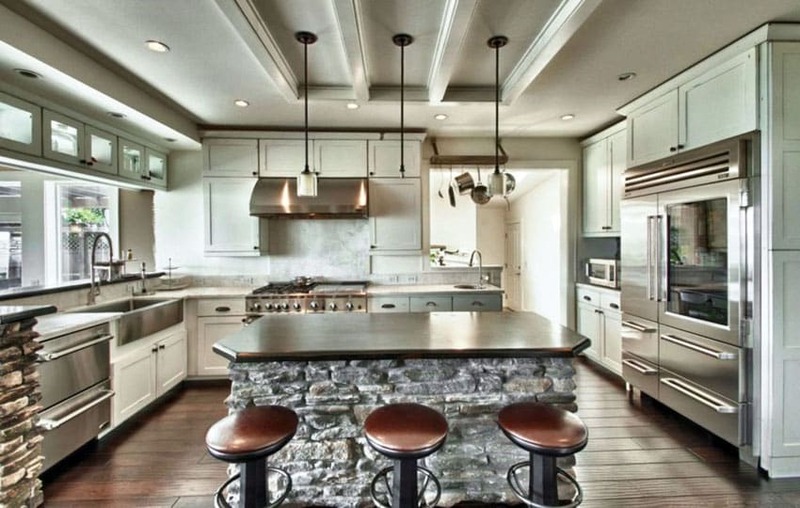 The large space dedicated for this gourmet kitchen was definitely maximized in this design. With a classic French style aesthetic, it gives off a very elegant and antique feeling to it. 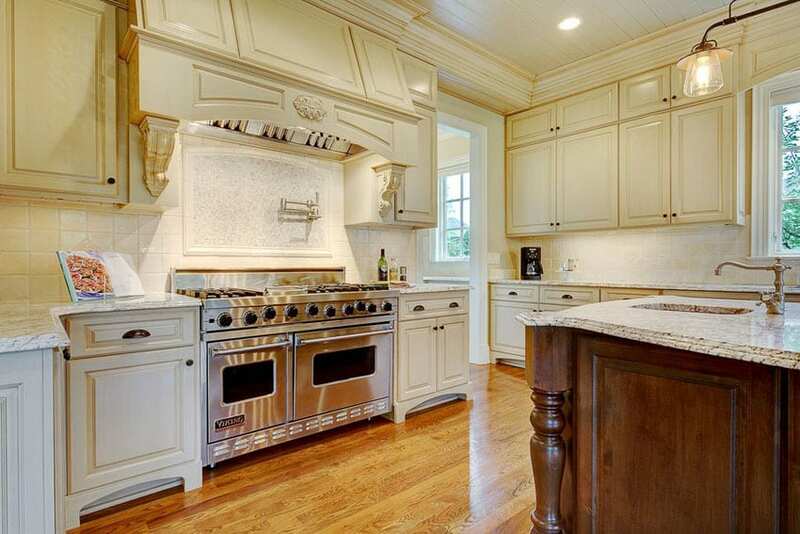 However, don’t let the vintage look fool you as this kitchen is fully equipped with modern equipment and appliances. It has a large enough floor space to allow multiple number of users at one time, making it a joy to work in this kitchen with your family. To coincide with the modern interiors, this kitchen also goes for a modern contemporary look, with clean lines and smooth surfaces. The large floor area is shared by the kitchen & dining area, but most of the walls are occupied by the kitchen, allowing lots of storage space. As it goes for a clean, modern design, kitchen equipment such as high-end Miele appliances are built into the modular cabinetry to blend in. The other modular cabinets are very minimalist as well, with no moldings, and a simple flat profile. The wall for stage and the built-in oven uses all white laminates, while the base cabinets for the rest of the kitchen uses dark gray. The rectangular kitchen island not only serves as a preparation area & bar counter, but also acts as a divider between the kitchen and the small dining area. 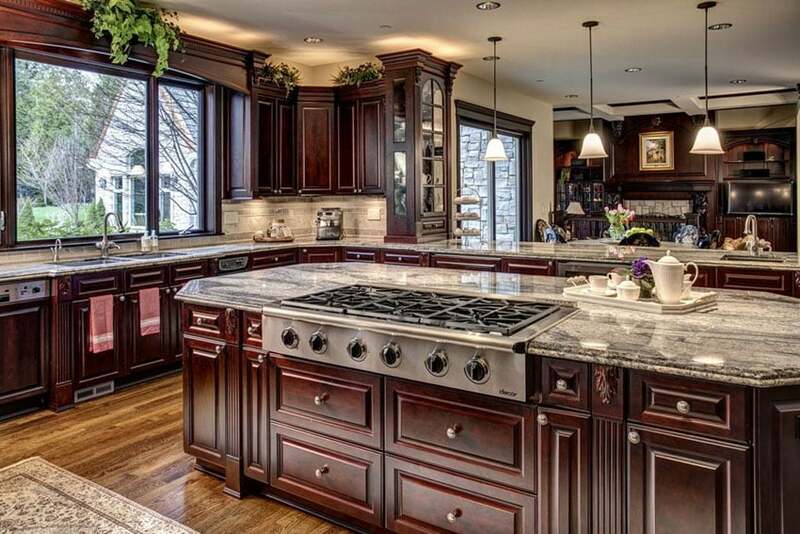 Vintage appeal is definitely given emphasis in this gourmet kitchen. It uses warm colors and a combination of textures to achieve this look. Teakwood kitchen cabinets are combined with golden granite counters, and paired with a brick backsplash with a combination of brick layout, creating an interesting pattern/texture on the surface. The multiple gas burner Viking stove top is an absolute favorite of chefs worldwide. Despite the lack of floor space, this gourmet kitchen instead maximized the high ceiling of the kitchen to allot for storage. This enabled them to dedicate the counter space for important kitchen equipment and appliances. The classic paneled cabinets are painted in a deep green color, giving it a rustic, masculine vibe. Going for a French-revival style, this gorgeous gourmet kitchen boasts of space, efficiency, and a great space workflow. 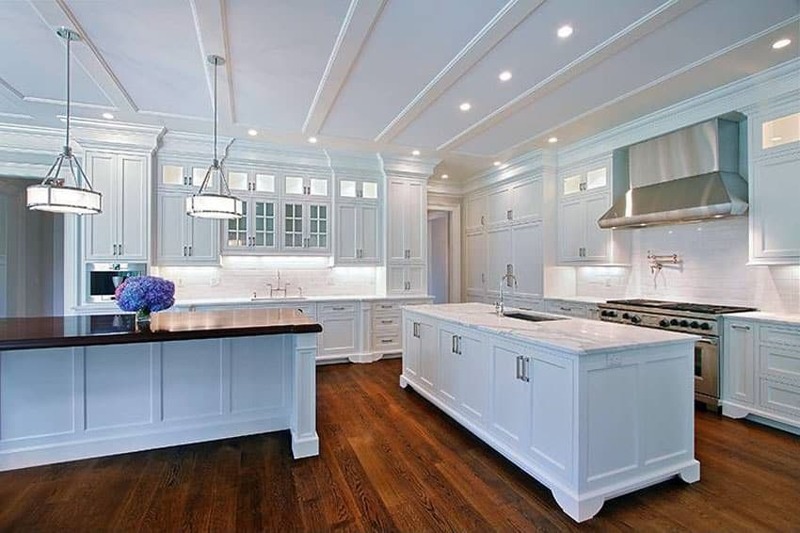 The classic-inspired cabinets are all in white, as well as the paneled ceiling. Countertop uses white marble & paired with white bricks for the backsplash, for a nice clean look in contrast with the Mahogany wood flooring. 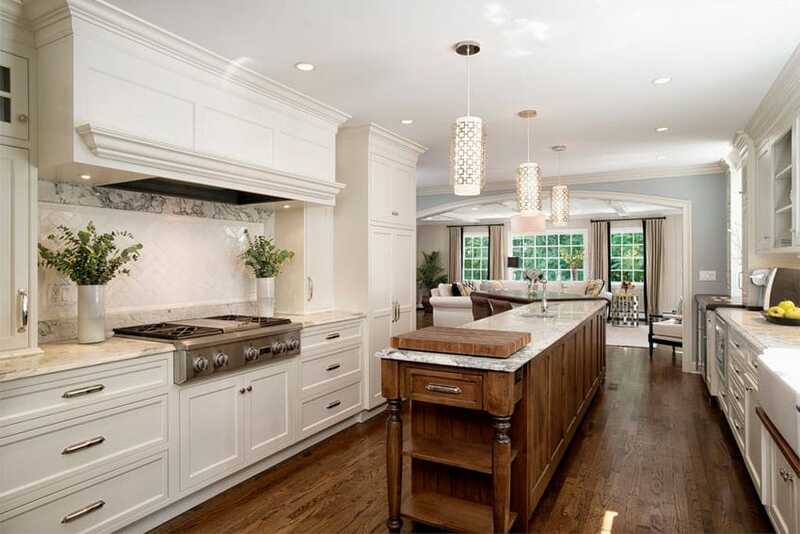 It has two large rectangular kitchen islands, one with a built-in sink, and one with hardwood countertop, allowing multiple people to work simultaneously in the kitchen. Even with smaller floor areas, a gourmet kitchen can still be achieved through efficient planning. This is a good example of a small gourmet kitchen which was able to create and efficient kitchen workspace by maximizing built-in equipment and storage. It has a transitional style, using light gray paint for the L-shape counter and a classic Mahogany finish for the marble-topped kitchen island. 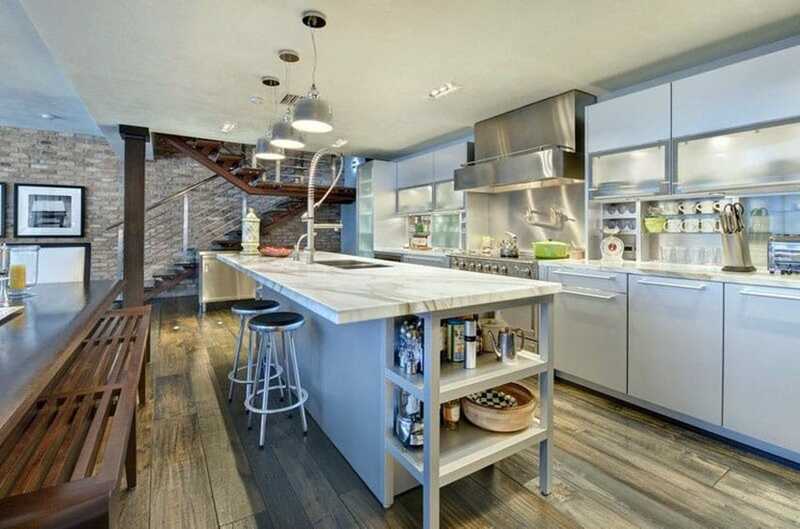 The open layout of this contemporary gourmet kitchen makes it feel more spacious and airy. Rustic walnut floors sets a warm atmosphere in the space, emphasized further with the use of warm white lights. The kitchen is very simple – creamy white cabinets and a long multi-level kitchen island which divides the counter into a worktop & a high bar area. 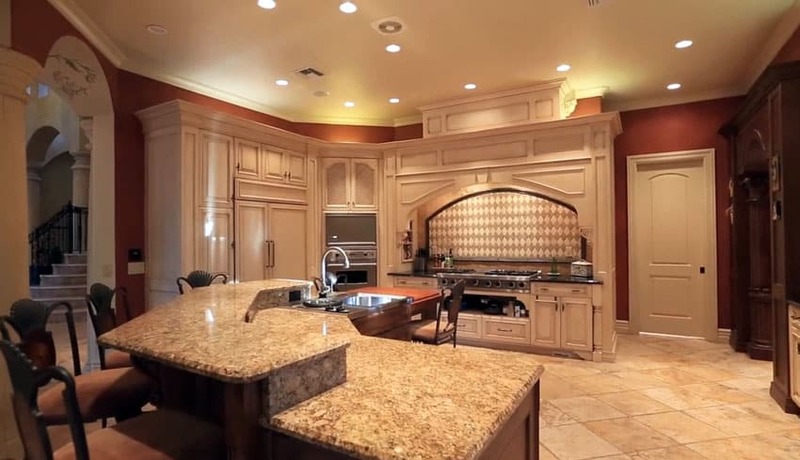 This lovely Tuscan style gourmet kitchen has a great combination of finishes. The combination of Golden Oak flooring and kitchen island with the creamy white paneled cabinets creates a gorgeous look with a very elegant appeal. Kitchen equipment and appliances were also built into the cabinets for a cleaner layout and to help the stainless steel equipment blend in with the classic cabinetry. 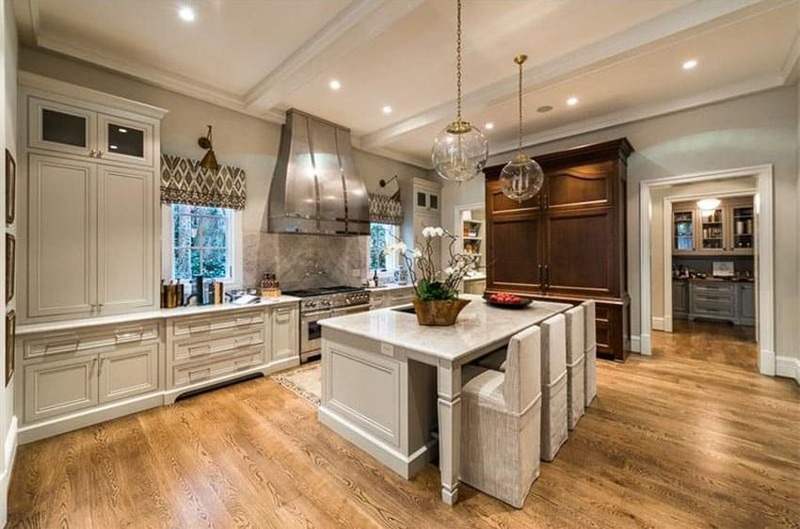 Boasting both space and ceiling height, this gourmet kitchen is definitely a show-stopper. The large floor area & high ceiling allows the use of larger equipment, bigger kitchen island and darker colors. This example uses a combination of modern and rustic finishes, creating an industrial-inspired look. Kitchen cabinets are made from cherry wood for that warm classic feel, and topped with black granite for a modern look. The stainless steel kitchen appliances and equipment, though built-in, were not concealed, and instead leaves its stainless steel finish stand-out from the cabinets, making them easy to locate. It also uses a uniquely-shaped and massive kitchen island, which has a raised platform in the center with rubber tree accents. 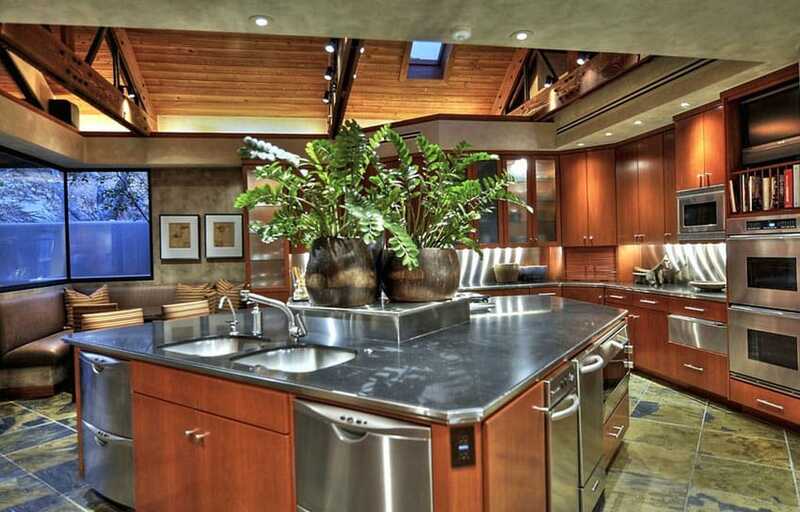 The enormous kitchen island allows simultaneous users without traffic flow issues. A very attarctive transitional style kitchen which uses simple cabinetry with rustic finishes to achieve this sombre look. Light walnut floors adds texture and a subtle warmth to the space, while the dark Mahogany cabinets adds a bold touch to the mostly-gray walls. The kitchen is equipped with a large two-door fridge, a wine chiller and other professional-grade appliances built into the cabinetry. 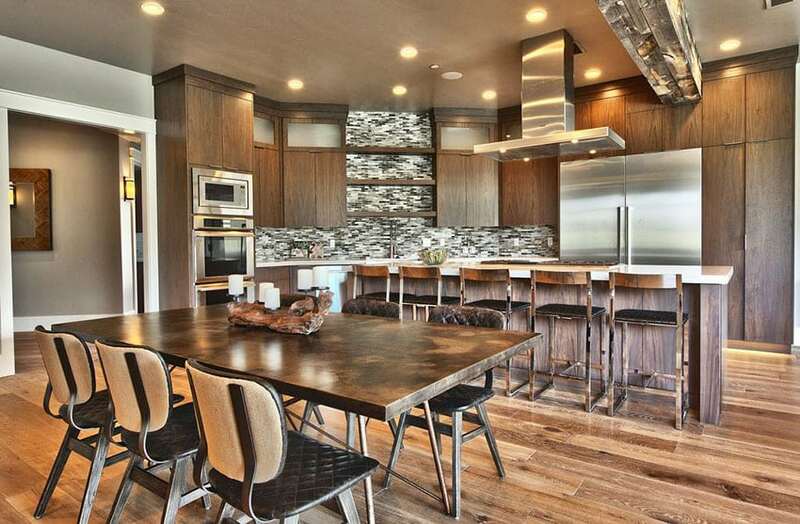 There is also a kitchen island which functions as additional work space & a dining/bar area. Combining Mediterranean architecture with Baroque interiors creates a great balance of light and massive elements. The high ceiling and large arch openings of the architecture helps balance the massive nature of the furniture pieces. For this example, solid walnut kitchen cabinets with a masonry range hood were used for the built-in cabinets, while a smoother dark wengue finish was used on the massive kitchen island with black galaxy granite countertop. Going for a very warm color scheme, this gourmet kitchen uses wood finishes with strong orange/red undertones to achieve this look. Redwood flooring was combined with solid cherry wood kitchen cabinets, while the natural sandstone counters and taupe walls help tone down the strong orange tones, while still keeping with the warm color scheme. The large fridge and ovens were grouped together at one side, the gas range placed on another wall, and the washing area was placed on the kitchen island, for an efficient workflow. Combining entertainment with food preparation was put in the forefront while designing this neo-classic gourmet kitchen. Terracotta orange walls creates a bold and rustic background color, helping the white cabinetry stand-out. Kitchen equipment were built-in and concealed within the cabinets so that it maintains a very traditional look. It also places a large L-shape kitchen island which serves as a preparation & washing area, as well as a divider since it has a higher bar counter attached, allowing you to entertain guests while preparing food. This gourmet kitchen goes for a more formal classic feel for its kitchen design, using redwood kitchen cabinets and gray marble for the countertop, creating a bold yet elegant look. In order to maintain the traditional look of the space, kitchen equipment were built into the cabinets and concealed inside, showing only the controllers for easy access. Gourmet kitchen design ideas don’t need to be contemporary. For those who love traditional style kitchen cabinets but dislike the “heavy” and intimidating look it gives would love this example, as it uses a lighter maple wood for the cabinets instead of the typical oak, walnut or mahogany. This gives it a light yellow/creamy color, making it look lighter and more modern. The professional grade Viking oven is popular with chefs world wide and definitely gives this space a gourmet feel.